Whilst antibiotics are something of a modern miracle (and seem to be winning the battle against my infection – thankfully, today I am slightly less like a plague-ridden fourteenth century peasant) it’s a different cure I’m blogging about – knitting, obviously. This is a jumper I knitted up earlier this week, and although I’ve spent the last couple of days in my pyjamas on the sofa with my leg elevated, it has brought a little joy on the one day I’ve managed to wear it so far. This was my Christmas knitting relief jumper, made from yarn I bought on our recent trip to Berlin. It’s Bouton d’Or Cocoon, a blend of 60% alpaca and 40% wool and is so soft it was clearly spun by pixies. I knew I wanted a simple jumper, with a little brightly coloured edging, that would go with a pair of jeans but not so sloppy that I couldn’t wear it to the office. At first I was knitting it using the recommended needle size of 4.5mm, but I should have heeded the advice of the kind woman in the yarn shop who said it was worth going up a needle size or two. So I jumped to a 6mm and the stiff, unyielding fabric transformed into a cosy, snuggly wonder. I used an alternate tubular cast on at the neck, hoping for a neater edge, but I needn’t have bothered really. After the neckline, it was a simple raglan increase, split for the sleeves, a little waist shaping and boom! – a jumper done in next to no time. I haven’t blocked it yet and I think a gentle soak will smooth it out a little, but I’m really happy with it as it is. Meanwhile, I’ve been working on my brother’s cardigan and I’ve joined the sleeves and body and am about to start the raglan decreases. But with 343 stitches per row, it’s not moving very quickly. On the other hand, neither am I at the moment, so we’re kind of suited to one another. There really is knitting for every occasion. Are you going to share the pattern with us? I just finished my first sweater (a 2 year project), a raglan sleeve with a big cowl. Now I wish it didn’t have a cowl, but I have no idea how to get one of these nice necklines. I don’t really have a pattern as such, but there are lots of good top down raglans out there if you want a guide. I just cast on 80 stitches, did 5 rows of ribbing, and then started the raglan increases. Thanks so much…that sounds easier than it looks. I can figure out the raglan, and 5 rows is not so much to cast on that it could be frogged if need be. Thanks again! Looks great and so comfy! I love wool and alpaca mixes. Yummy yarn! I hope it wears well. I remember what you said in the podcast about picking a pattern for your brother – I couldn’t agree more. I modified Owls so my husband could wear it. He loves owls and I wasn’t finding any pattern for a men’s knit that could match Kate Davies’ sweater. How about some WIP shots of your brother’s cardi? But, most importantly, I hope you get well soon! Thank you. I really like the idea of a man’s Owls jumper! Hope to have some photos of the cardigan soon. now that i know you’re going to survive the plague, i think i’ll go watch a bit of monty python holy grail-you know for just a bit of comic relief. This is gorgeous! I love the color of the collar and it looks incredibly cozy. 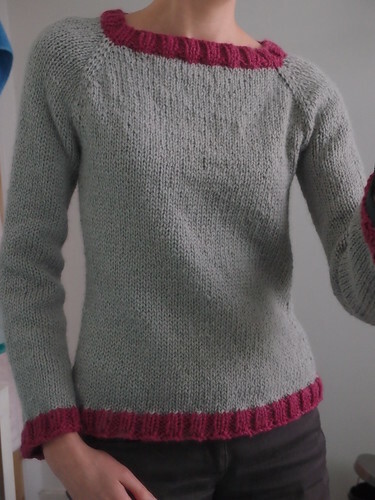 Hi, I love the jumper and would be interested to know exactly where in Berlin you bought the yarn? I went to school in Berlin and still have many friends there, so I visit often. My next trip is in March. I fancy having a nose around this shop to see what other goodies I might find there. Thanks. It was from a shop called Made in Berlin. Really lovely with very good cake and friendly staff. They told me they specialize in non-German yarns to offer Berlin knitters something different. Ooh now that is lovely! Good gracious! I’m way behind in listening to the podcasts (always enjoy), so I had no idea you were sick and suffering until I popped in here at the blog. Hope you are much better by now and taking good care of yourself. Dude! Are you OK?! It’s been ages, and I fear the worst. How’s the leg? Over here in the States we’re all dropping like flies from the flu. I hope you are recovering well and knitting like mad.